Our Singing Waiters, undercover opera singers and acclaimed opera Singing Chef Marco are ready and waiting to surprise and entertain your wedding guests, corporate clients or family and friends. For Wedding Entertainment, Office Parties, Birthdays, Corporate Entertainment, indeed any celebration, event or occasion, with their stunning stage presence and great comic timing, our amazing Irish singing waiters are the best in the business! Singers for Hire Singing Waiters are completely self sufficient. We aim to provide all necessary sound equipment. Our Singing Waiters and Singing chef will liaise directly with your wedding venue to ensure the best production values and we always guarantee the best possible night’s Surprise Singing Waiter wedding entertainment. Great entertainment for weddings! Surprise singing waiters & the singing chef make for perfect wedding entertainment. 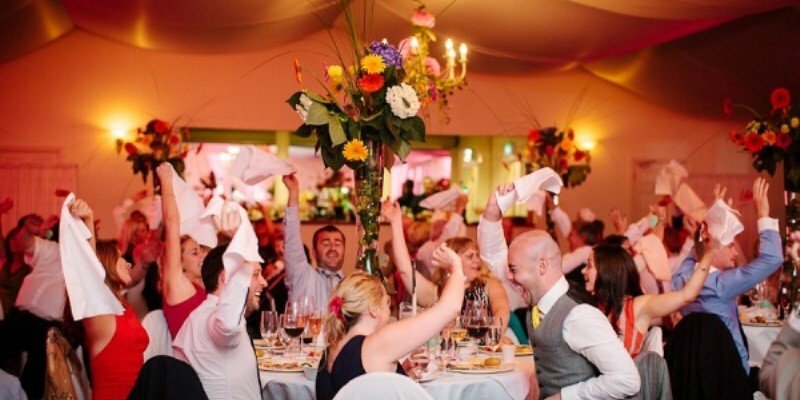 Imagine your wedding guests’ surprise and delight when the Singing Chef or one of your waiters burst into song…. As wedding entertainment our waiters blend with regular staff at your wedding, albeit with a twinkle in their eyes and a few more comments to guests than a normal staff member. At a given point, the undercover entertainer causes a distraction and the singing chef bursts into song, serenading guests and sometimes even offering to shave them as the “Barber of Seville”! Unforgettable Wedding Entertainment. Impressive, fun and stylish wedding entertainment. Our Undercover Waiters show and surprise singing chef routine offer a fun presentation with a broad audience appeal. Our amazing wedding singers are professional entertainers with international profiles they perform a wide range of musical styles, not exclusively opera. Our Surprise Waiters or Singing Chef can perform a repertoire that will work for just about any event including: Corporate Events, Birthday Celebrations, Wedding Entertainment, Charity Events, Dinner Dances & Civil Partnerships. What you say about The Singing Chef & Co.
Quality service for corporate entertainment bookers. Singers for Hire are more than just wedding entertainment we are specialists in corporate and event entertainment. Our singing waiters and singing chef Marco have impressed the clients of some of Europe and America’s most successful organisations and event management companies. We are proud to supply globally and nationally recognised corporations and brands with their Corporate Event Entertainment and production requirements. Singers for Hire Singing chefs have sung at corporate events for some of the largest organisations in the world. from opera recitals to Broadway showstopper revues, Undercover Chefs, Three Tenor shows, Rat pack shows and more. Drawing from our talented pool at Singers for hire in a wide variety of styles we can build the perfect post dinner musical entertainment for you and your guests. Our highly successful surprise after dinner shows are perfect for golf club get-togethers, corporate events, wedding entertainment, charity dinners, team building sessions & Christmas parties. Our favourite one man surprise chef singer show – The hard working Mediterranean chef “Marco” (who has the most ridiculous taste in trousers and footwear!) is on his last night in the hotel. He wants to check that everything is to the wedding guests’ expectations. While this surprise singing waiter has the microphone he would like to thank his employers. He’s moving to Las Vegas to pursue a career as an Elvis impersonator – of course everyone wants him to sing but no-one expects what happens next….cue music, laughter and unforgettable entertainment. From Singers for Hire’s vast repertoire, set lists for our singing waiters shows are compiled to between 25 and 40 minutes featuring a variety of popular and fun opera, swing and Broadway hits. Audience interaction is part of the job for a singing chef. Our most popular singing waiters set list includes Agustín Lara’s spectacular “Granada”, the Dean Martin hit “That’s Amore”, “O Sole Mio” the classic Neapolitan serenade, the ever popular “Funiculi Funicula”, “Oh Mio Babbino Caro” by Puccini, Sinatra classics “New York, New York”, “That’s Entertainment”and “My Way” with the wonderful “Time to Say Goodbye” finale and many, many more. At Singers for Hire we love to hear from you. So drop us a line with any questions about our entertainment options for your wedding or event.